Mr. Q is a Vietnamese immigrant, age 45, with myasthenia gravis (MG), Graves’ disease, and a history of 1 prior myasthenic crisis (MC) that occurred 5 months ago. He presented to the emergency department after 2 days of dyspnea, right flank pain, and fatigue with tachycardia (118 beats per minute [bpm]), fever (107.2° C), O2 saturation 97% on nasal cannula, and a normal negative inspiratory force (NIF) of −30 cm H2O. His wife reported that it seemed he’d had a cold. Over the next 3 hours, he developed shortness of breath despite oxygen saturation of 96% via nasal cannula and was admitted. His blood pressure was 121/81 mm Hg, he had dry mucus membranes and labored breathing, poor respiratory inspiration with accessory muscle use, and supraclavicular retraction. His neurologic exam was remarkable for moderate left ptosis. Mr. Q was diagnosed with MG 10 months ago and quit smoking 3 months later. He has a past medical history of hypertension and uncontrolled insulin-dependent diabetes mellitus. He consumes a moderate amount of alcohol (3-3.6 oz/week) and denies illicit drug use. He has no family history of neurologic disease. At the time of his diagnosis with MG, Mr. Q presented with right ptosis that had been present for a month and progressively worsened throughout a day. His blood test results showed an elevated acetylcholine receptor (AChR)-binding antibody level of 11.1 nmol per L (normal < 0.4 nmol/L). A chest CT revealed a mediastinal mass, and Mr. Q had a thymectomy via median sternotomy 4 months later that yielded a 209-g well-circumscribed thymoma. Mr. Q’s blood-test results 2 months after thymectomy showed the presence of thyroid-stimulating immunoglobulin, leading to a diagnosis of Graves’ disease. At a follow-up clinic visit, neither eye was ptotic, but Mr. Q reported generalized fatigue. Mr. Q presented at the emergency room 5 months after his initial diagnosis of MG with worsening dyspnea. His neurologic exam was remarkable for a moderate left ptosis. Results of laboratory studies and a chest radiograph were unremarkable. 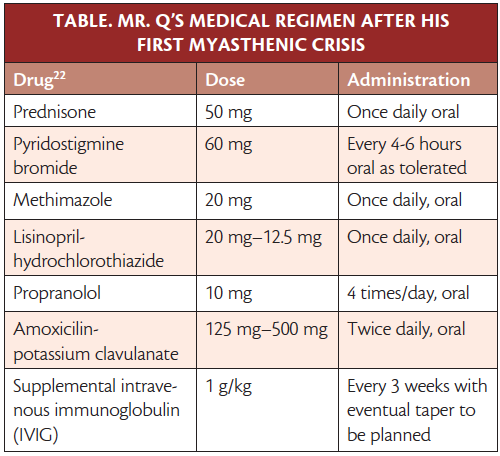 On day 3 of this episode, Mr. Q was intubated for impending hypoxic respiratory failure and treated with high-dose prednisone and intravenous immunoglobulin (IVIG), chosen because Mr. Q had not had a significant clinical response to plasmapheresis (PLEX) previously. Because there was no clinical response, a 14-day course of 200 mg per day oral cyclophosphamide and 50 mg per day oral prednisone, was initiated. Mr. Q responded to this treatment and was able to be extubated on day 8 of the episode. This MC was attributed to his recent thymectomy. He was discharged on day 11, having returned to his baseline. At discharge, he was on the medical regimen in the Table and also instructed to complete the 14-day course of 200 mg per day cyclophosphamide and then continue taking cyclophosphamide at a dose tapered every 2 to 4 weeks by 50 mg per day until discontinued. Mr. Q’s blood test results included a white blood cell count of 8 x 109 per L and lactic acid of 1.2 mmol per L. Thyroid stimulating hormone (TSH) level and blood and urine cultures were ordered, and when his shortness of breath increased, it was recommended that workup for sepsis as a cause of MC be continued. An abdominal CT revealed a punctate nonobstructing right inferior pole calculus, a 2-mm nonobstructing left inferior pole calculus, and mild right hydronephrosis with a small distal obstructing ureteral calculus. Eventual urinalysis results were consistent with a urinary tract infection (UTI) and blood cultures later demonstrated the presence of E. coli. Mr. Q’s repeat NIF 4 hours after admission was −35 cm H2O, with a fair patient effort. He was intubated 6 hours after admission due to impending hypoxic respiratory failure and administered 1,250 mg vancomycin for suspected pyeloneph-ritis. On day 3, Mr. Q had cystoscopy, right retrograde pyelogram, and right ureteral stent placement. On day 4, he failed to be extubated, secondary to MC precipitated by urosepsis. Mr. Q was treated with high-dose prednisone (IV equivalent 60 mg for 3 days, then 60 mg orally per day) in addition to his ongoing maintenance IVIG dose or 1 g per kg every 3 weeks, which he had most recently completed 2 days before admission. Given his recent IVIG treatment and previous lack of response to PLEX, neither treatment was initiated upon admission. Mr. Q did not respond to treatment with high-dose prednisone and so treatment was amended to include 1 mg pyridostigmine bromide (PB) every 3 hours 125 mg solumedrol per day, both administered via IV. Neurology recommended a cyclophosphamide rechallenge once blood cultures were negative, which occurred on day 5. Cyclophosphamide was restarted at 200 mg per day via IV and Mr. Q was extubated on day 10. On day 14, after having completed a 10-day course of IV PB, cyclophosphamide, and prednisolone, he was discharged. He was instructed to take 200 mg oral cyclophosphamide per day for 2 weeks and then 50 mg daily. He was also directed to continue 50 mg prednisone per day and 30 mg PB by mouth every 4 to 6 hours as tolerated. At 3 months after resolution of his second MC, Mr. Q’s diabetes was not well controlled and his MG symptoms were worsening, such that additional steroid-sparing treatment was required. His dose of cyclophosphamide was increased to 100 mg per day to reduce the need for additional corticosteroids, given his coincident diagnosis of diabetes mellitus. He was instructed to also continue taking 60 mg prednisone per day. Mr. Q remained stable on 25 mg of cyclophosphamide daily, and then successfully tapered off prednisone. 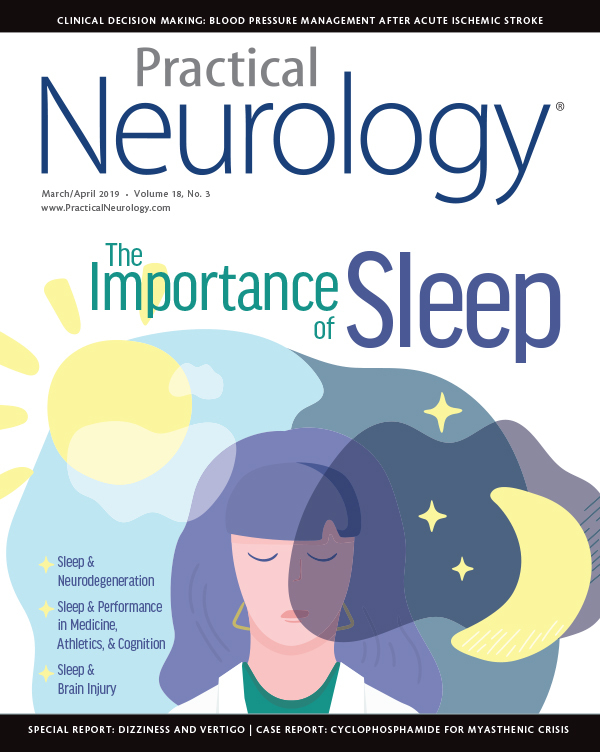 At his most recent follow-up visit, 3 years after his initial diagnosis he was not using any immunomodulatory therapy and had an unremarkable neurologic examination. We present a case of a man who did not respond to either IVIG or PLEX but did respond to induction and maintenance therapy with cyclophosphamide. He has not experienced another crisis since tapering off his maintenance dose of 25 mg oral cyclophosphamide daily. While a delayed effect from corticosteroids may have contributed to the resolution of his MC, it is less likely given the fact that he had not previously responded to corticosteroids and had a profound temporal response to cyclophosphamide. Approximately 15% to 20% of patients with MG experience MC, usually within the first year of disease onset.1,2 These attacks may be triggered by physical or emotional stress, pharmacologic agents (eg, muscle relaxants, benzodiazepines, D-penicillamine, beta-blockers, quinolone antibiotics), pain, sleep deprivation, and infection.2-4 Pharmacologically induced MC is postulated to occur when a drug interferes with electrical transmission at the neuromuscular junction,5 but optimal treatment of MC has yet to be established. There is a paucity of literature regarding patients in MC who fail the recommended first-line treatment of corticosteroids, IVIG, and PLEX. The recommended first-line agents for MC treatment are high-dose corticosteroids, IVIG, and PLEX.3 There is, however, a paucity of evidence regarding the mechanism of action, efficacy, and relative effectiveness of these treatments. Thus, MC is managed on an individual basis based on the preferences of the patient and provider in the context of comorbid conditions, (eg, diabetes mellitus). The mechanism of IVIG is unknown and theorized to be related to interference with the anti-idiotype antibodies, their clearance, and possibly the function of the Fc receptor.9 Despite its widespread use, however, there are only 2 published reports of its use in patients with MG exacerbations. In a randomized double-blind placebo-controlled study, 2 weeks after treatment patients with MG exacerbation who received 2 g per kg of IVIG had improved quantitative myasthenia gravis scores (QMGS) compared with patients with MG exacerbation treated with placebo consisting of an equivalent volume of 5% IV dextrose over 2 days.10 Another randomized, double-blind study reported no significant difference in outcomes for patients treated with 2 mg per kg vs 1 mg per kg IVIG for treatment of an acute MG exacerbation.11 Another study reported that prolonged IVIG treatment may reduce the number of MG exacerbations per year as well as a decreased need for corticosteroids.12 Notwithstanding, none of these studies specifically addressed IVIG for acute treatment of MC. By decreasing plasma components, PLEX removes serum autoreactive antibodies. After 1 to 2 weeks of treatment, PLEX reduces 90% of patients’ AChR binding antibodies.13 These effects are transient and may be complicated by immunologic rebound that can result in rapid production of AChR binding antibodies and resultant MC.14 Thus, immunosuppressants are often added when PLEX is initiated. Cyclophosphamide is an antineoplastic drug that is hepatically biotransformed to active alkylating metabolites by a mixed function microsomal oxidase system. These metabolites inhibit rapidly proliferating cells, such that it is the standard treatment for several malignancies including chronic lymphocytic leukemia, Hodgkin’s and nonHodgkin’s lymphoma, and multiple myeloma.15 Through DNA alkylation, cyclophosphamide effectively diminishes the quantity of B cells, resulting in tumor regression.16 Therefore it is postulated that cyclophosphamide may prove useful for reducing B cell-produced autoreactive antibodies that may precipitate MC. The literature suggests cyclophosphamide as a possible pharmacologic intervention for MC but no formal investigation of its efficacy has been conducted. Myasthenic crisis is a complication of MG defined as respiratory compromise that may require intubation and mechanical ventilation. Although there is little evidence-based medicine to guide treatment of patients with MC, IVIG and PLEX are considered first-line agents. Immunomodulatory agents such as cyclophosphamide have begun to emerge as possible interventions, although no formal guidelines exist. We suggest cyclophosphamide be considered as a rescue treatment for refractory MC. 1. Phillips LH II and Torner JC. Epidemiologic evidence for a changing natural history of myasthenia gravis. Neurology. 1996;47(5):1233-1238. 2. Thomas CE, Mayer SA, Gungor Y, et al. Myasthenic crisis: clinical features, mortality, complications, and risk factors for prolonged intubation. Neurology. 1997;48(5):1253-1260. 3. Chaudhuri A and Behan PO. Myasthenic crisis. QJM. 2009;102(2):97-107. 4. Sanders DB. Disorders of neuromuscular transmission. In: Daroff RB, Bradley WG, Fenichel GM, Marsden CD (eds).Neurology in Clinical Practice. Boston: Butterworth-Heinemann. 1991; 1819-1842. 5. Hwang IH, Lee KN, Kim IY, et al. Myasthenic crisis after a renal transplant successfully treated with intravenous immunoglobulin. Experiment Clin Transplant. 2014;6:555-558. 6. Howard FM Jr, Duane DD, Lambert EH, et al. Alternate-day prednisone: preliminary report of a double-blind controlled study. Ann NY Acad Sci. 1976;274:596-607. 7. Lindberg C, Andersen O, Lefvert AK. Treatment of myasthenia gravis with methylprednisolone pulse: a double-blind study. Acta Neurolog Scand. 1998;97(6):370-373. 8. Pascuzzi RM, Coslett HB, Johns TR. Long-term corticosteroid treatment of myasthenia gravis: report of 116 Patients. Ann Neurol. 1984;15(3):291-298. 9. Tha-In T, Bayry J, Metselaar HJ, et al. Modulation of the cellular immune system by intravenous immunoglobulin. Trends Immunol. 2008;29(12):608-615. 10. Zinman L, Ng E, Bril V. IV Immunoglobulin in patients with myasthenia gravis: a randomized controlled trial. Neurology. 2007;68(11):837-841. 11. Gajdos P, Tranchant C, Clair B, et al. Treatment of myasthenia gravis exacerbation with intravenous immunoglobulin: a randomized double-blind clinical trial. Arch Neurology. 2005;62(11):1689-1693. 12. Sorgun MH, Sener HO, Yucesan C, et al. Intravenous immunoglobulin for prophylaxis of acute exacerbation in myasthenia gravis. J Neurol Sci. 2014;35(6):891-896. 13. Thornton CA and Griggs RC. Plasma exchange and intravenous immunoglobulin treatment of neuromuscular disease. Ann Neurol. 1994;35:260-268. 14. Yazdi MF, Baghianmoghadam M, Nazmiyeh H, et al. Response to plasmapheresis in myasthenia gravis patients: 22 case reports. Romanian J Int Med. 2012;50(3):245-247. 15. IARC Monographs on the Evaluation of Carcinogenic Risks to Humans. WHO Press. 2012; 100A: 63-65. 16. Robak T and Kasznicki M. Alkylating agents and nucleoside analogues in the treatment of B cell chronic lymphocytic leukemia. Leukemia. 2002;16:1015-1027. 17. Gold R and Schneider-Gold C. Current and future standards in treatment of myasthenia gravis. J Am Soc Exp Neurotherapeut. 2008;5:535-541. 18. Sieb JP. Myasthenia gravis: an update for the clinician. Clini Exp Immunol. 2013;175:408-418. 19. Zeitler H, Ulrich-Merzenich G, Hoffman L, et al. Long-term effects of a multimodal approach including immunoadsorption for the treatment of myasthenic crisis. Artific Orgs. 2006.30(8):597-605. The authors have no financial or other relationships to this conternt to disclose. With careful diagnosis, treatment can improve symptoms of congenital myasthenic syndromes.